July 25, 2018 – Rolla, MO – In 2014, Brewer Science officially opened the doors to its new high-tech manufacturing center at the Rolla National Airport located in Vichy, MO, which incorporates the industry’s highest standards in manufacturing into the design of the building. The new manufacturing center has continued to be a welcome addition to the region, providing additional employment opportunities and the ability to manufacture high quality products for Brewer Science customers. Adding value is one of the pillars of Brewer Science culture and as a new member of the Vichy business community, Brewer Science recognized a need by providing support for the Vichy Volunteer Fire Department. In the spring of 2018, Brewer Science began working collaboratively with John Butz, City Administrator for the City of Rolla; Ron Smith, Fire Chief, City of Rolla Fire & Rescue; Cyndra Lorey, Executive Director for the Rolla Regional Economic Commission; and Bonnie Prigge, President of the Vichy Volunteer Fire Department, to develop an action plan for improving the Vichy department’s ISO insurance rating. With assistance from Brewer Science, along with support from the City of Rolla and its fire department, the Vichy Volunteer Fire Department is purchasing additional equipment and enhancing training activities in an effort to continue to improve the department’s ISO rating. Property owners within the Vichy Volunteer Fire Department Service area will benefit from the outcomes of the collaboration which will help to provide a safe environment and increase the quality of life in the region. Brewer Science is proud to be a part of the collaboration and communication within communities like Vichy, Missouri, that will continue to open doors for new opportunities for growth and the effective utilization of resources. 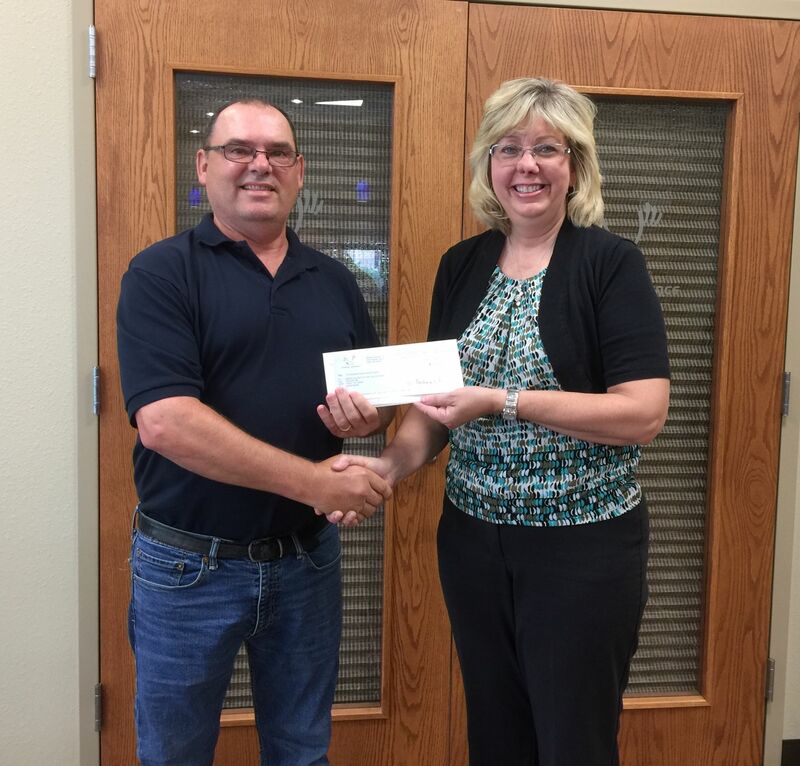 Kevin Veik, Director of Business Architecture at Brewer Science presents Bonnie Prigge, President of the Vichy Volunteer Fire Department, with a check to assist with the needs of the Vichy Volunteer Fire Department.